Last night was the last time we sleep in our house. 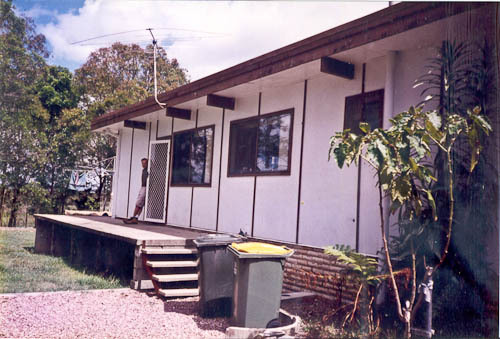 It’s been ten years to the day since we bought our first house and moved in. It’s been a good house — we’ve run a successful business and had our four children here — but now we’re ready to move on with our lives. We’re happy to remember the good times we’ve had at this house — and all the work we’ve put into it! Here are some pictures to show what we’ve done with the place. We bought the ugliest house on a nice street. The front entrance was spectacularly boring. Rendering the front brick and concreting the driveway has made a huge difference. This was the side of our house outside the kitchen. 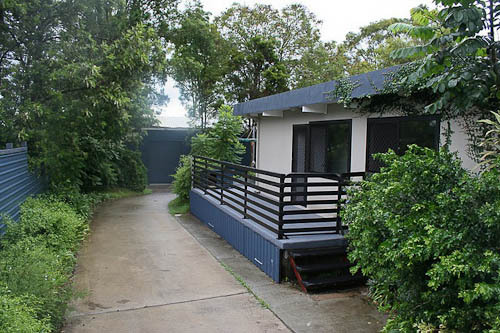 We added the shed and driveway in 2006 so we could move David's business' carpet and vinyl rolls out of the garage. 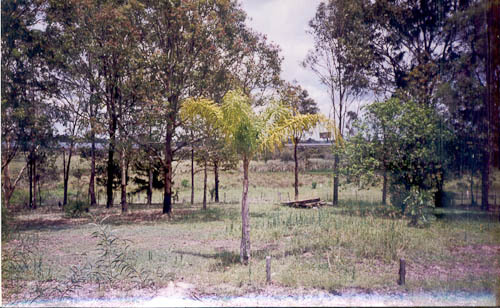 Our back yard in 2001. Apart from the mature trees, we've planted everything else. 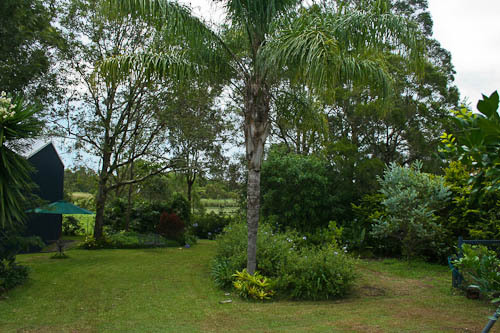 It's hard to believe this is the same back yard! The little palm tree has grown so much. 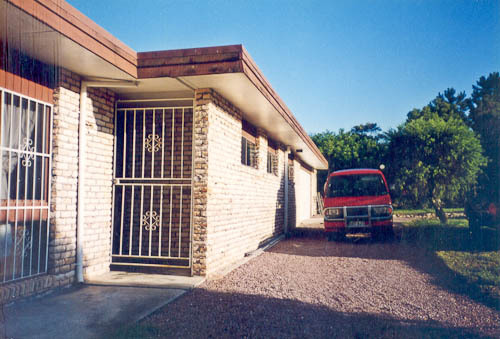 The interior of the house hadn’t been updated since it was first built in 1973. We were originally surrounded by green and pink wallpaper, exposed brown timber, dark brick features inside and holey carpet. 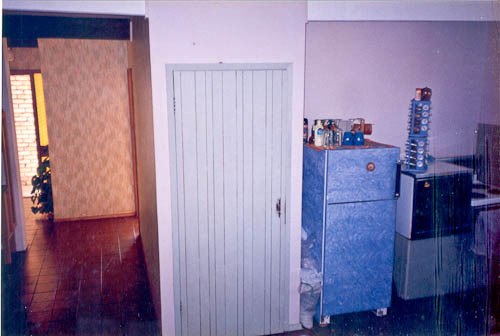 A glimpse of the entrance-way and kitchen. Do you like the brown ceramic tiles? 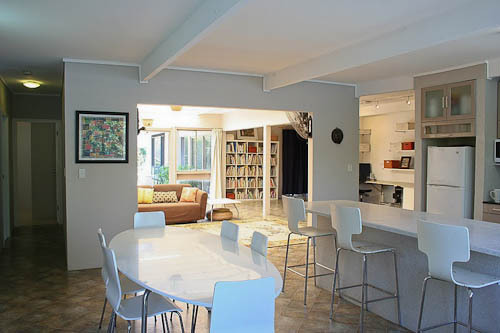 We completed our kitchen renovation less than two years ago. 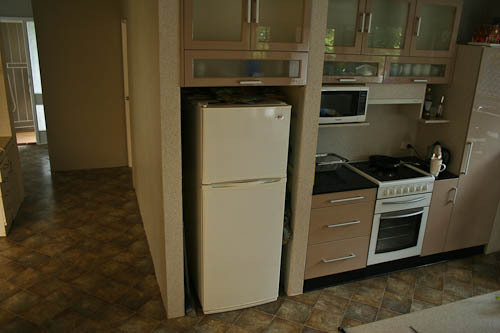 It's been wonderful to use a fully-functional kitchen with all the modern appliances! 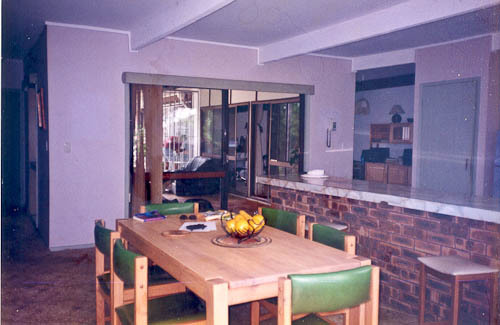 We originally had an outdoor courtyard area at the end of the kitchen counter. Later we enclosed it to make it our family room. Opening up the family room has made such a difference to the house! 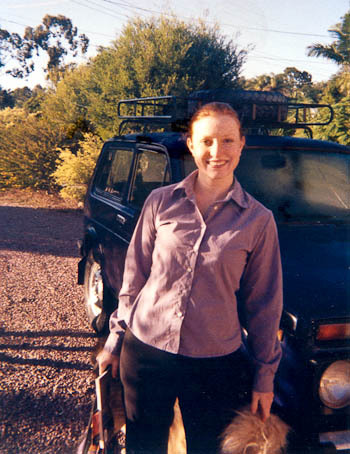 At the time we moved into our house, I was driving a Lada Niva — David painted it purple for me. 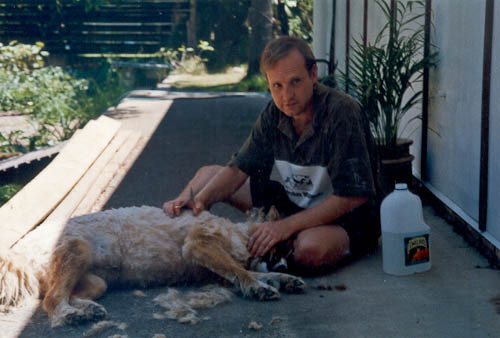 Here's a much younger David trimming Misty's hair on our back verandah. Tonight we’ll sleep in our truck and trailer, ready to hit the road again. We just need to hand over our car to its new owners tomorrow, and then we’re free to go. 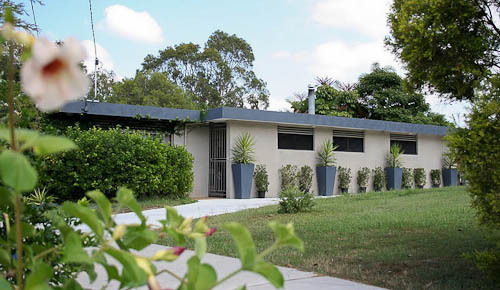 We’re driving south to stay in Grafton for a while before continuing our adventures further afield. When 40 metres is too far to walk, Skype! Lauren, the place looks great. My hat is off to you and David, looks like you guys did really well. Where are you off to? New Zealand? WHAT? Am I that far behind? Or did everything happen really fast? House looks great. I’m still trying to figure out if that’s the one you sent internet photos (or a 3-d tour kind of thing?) of way back in the late 90’s – Can’t remember the year but it was pre-babies for you and pre-husband for me. Wow! Enjoy the coming adventure! That is an amazing transformation! let me know when you are down our way and we can work out a catch up if it all falls into place with your timing etc. Today I am feeling a little discouraged. It is raining, and the house we have just moved into is a ‘renovator’s delight’. Smell seems to build up in this very wet weather, and mould that I have just cleaned up is returning and everything just feels yucky, and I am beginning to wonder why we signed up for this place. Then I take a look at your piccies – and I am encouraged. Encouraged to keep cleaning, fixing and putting love back into a place that has been neglected and run down for many, many years. Encouraged to remember the vision we have for this place. 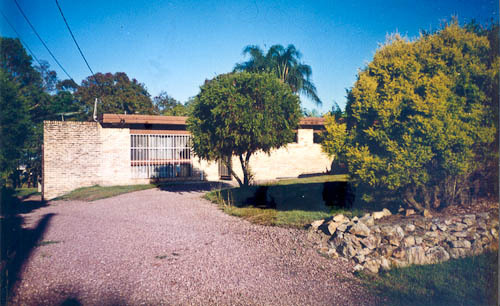 your blog is very interesting, inspire me to release my boring and rebuild my home surrounding.